Skip Weitzen, author of Hyper Growth and journalist covering new trends in business. 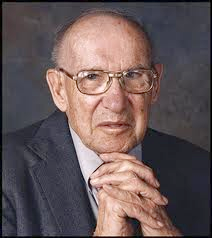 When Peter Drucker died in 2005 the world lost its management soul and self-described “social ecologist”. The father of modern management left a long trail of books and articles covering private enterprise, government, and the not for profit sectors of society. Over decades he seemed to have the knack to predict just about everything — from privatization to flatter organizations and from the rise of Japan to the emergence of the information society; and most important the value of knowledge workers. Dr. Drucker, taught at Claremont University in California, where the values-based School of Management is now appropriately named after him. His profound skepticism of macroeconomic theory made him more interested in practices, processes, and always objectives than grand theories. With his thick Austrian accent Drucker is still peering down over all of us mere mortals. Enter front stage … Theodore Roosevelt Malloch, who Lady Margaret Thatcher dubbed a “Global Sherpa” already in 1992 is emerging as the heir apparent. His refreshing thinking crosses disciplines as diverse as economics, decision-making, philosophy and theology. Ted Malloch teaches at Yale University and is best known for his strategy work with over 150 multinational companies. He has led the PricwaterhouseCoopers CEO Learning Partnership for 15 years, touching over 75000 CEOs worldwide, who want to “invent the future”. Having served on dozens of boards of directors in VC companies, mutual funds, and universities as well as on foundations and charities, he is no stranger to corporate governance. He has become an authority on reputation capital and the father of something dubbed, “spiritual capital”. As his name suggests his political connections are many and somewhat bipartisan. He has at an early age served in the US State Department, US Senate on Foreign Relations, as an ambassador in the United Nations during the cold war. He was on Wall Street in capital markets during Liar’s Poker. He was also on the executive board of the famous, Davos World Economic Forum. Recently he helped start the new Zermatt Summit to humanize globalization. Travelling to some 135 countries, Malloch is a pioneer of globalization who coined the term, “thought leadership”. His books on everything from trade and development in policy circles to perpetual learning in the academy to Doing Virtuous Business (Thomas Nelson, 2011) See: doingvirtuosbusiness.com have even been made into an Emmy nominated PBS documentary by that title. With big business under attack everywhere, Dr. Malloch’s work provides, as Drucker’s did, a light on a different road ahead. He has penned many books on counterintuitive notions like — thrift (before the crash) spiritual enterprises, and being generous. His latest project, with the European Academy of Business, asks what is the practical wisdom for management of the world’s six great historic faith traditions? His new book is entitled, The End of Ethics and it attempts to bring back the arc of trust so critical to global markets..
No small assignment, and no small mind. Move over Peter, your new counterpart may have arrived.